There has been a LOT of hype lately about a comet (C/2010 X1, aka Elenin), and to a lesser extent, an asteroid (2005 YU55). Of course, like all conspiracy theories there is always the off-hand chance that this one might actually have some merit. Oh, surely not, you say... but then again what exactly does Shirley have to do with this anyway? Despite the prevalence of bad puns, some of the hype might suggest some very interesting possibilities. Take, for example, some dates associated with Comet Elenin. Okay... now that you’ve memorized this table, consider what it actually means. 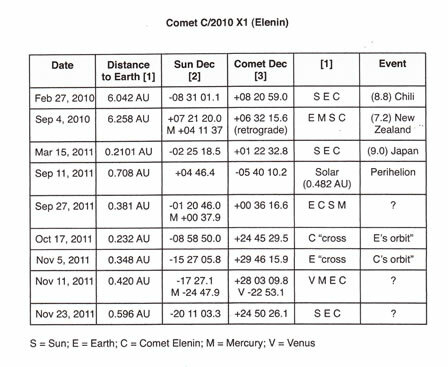 For example, on February 27, 2010 (my mother’s 100th birthday), the Comet Elenin was 6.042 AU from Earth (or 6.042 times the mean distance from the Earth to the Sun). The Sun was below Earth’s celestial horizon, while the comet was above -- and within ~12’ of being in a perfect alignment: from the Sun to Earth and on to Comet Elenin (which is to say that the Earth is between the Sun and Elenin). This date is also the date for an 8.8 Richter Scale Earthquake in Chili. Then in September of that year, Elenin was closer to the Sun, but further from Earth (because the Earth was now on the opposite side of the Sun from Elenin -- apparently running in abject fear from the very threatening comet whose nucleus might be 3 to 4 thousand kilometers in diameter). There was, again another alignment, this one including Mercury (i.e. Earth, then Mercury, then the Sun, then Elenin). The alignment was primarily a Right Ascension alignment (which shows up really nicely on the orbital diagram from the NASA Horizon website ), but the Declinations (including heavily inclined Mercury) are not quite as close. Still, there was the New Zealand 7.2 Earthquake thereabouts. But of course, all of these earthquakes are purely coincidence... right? Well... if we’re going to have a real conspiracy theory... then there is no such thing as coincidences or random events... and furthermore, we will have to assume that these events are indicating something far more sinister... or alternatively more beneficent... even, perhaps, divinely inspired. Now... given this past, it’s now time to slip into the future... with all its unknowns and speculations. 9/11/2011 is ALSO the date of Elenin’s perihelion, it's closest approach to the Sun. Coincidence? Our old friend, Richard Hoagland (see, e.g., Iapetus) finds that a bit of a stretch... as does Project Camelot -- both of whom can spend hours on the subject! Meanwhile, roughly two weeks later, we have yet another alignment: one involving the Earth, Comet Elenin, the Sun and Mercury. In fact, quite a good one, particularly between Elenin and Mercury. This 9/27/2011 date is important in that IF a major earthquake occurs on this date, it's really going to get MY attention... and perhaps the attention of others <grin>. This bit comes under the category of a prediction, and in the event it doesn’t happen, the theorists will have to do some urgent rationalizations. If on the other hand, there is a major earthquake... then, all bets are off. The next two dates are... well... a bit more questionable. In one case, the Comet allegedly "crosses the Earth’s orbit"... at least in the two dimensional diagram . And then the Earth "crosses the Comet’s orbit at the previous point". However, in three dimensions, there is this nasty dimension of height, and these claims of "crossings” may be seriously misleading. Much has been made by some researchers, but the evidence does not appear to be strong for anything notable. On the other hand, the next date... the Prophetic 11/11/11 (drum roll please; cue the long-stemmed trumpets)... 11/11/11 does indeed have some serious possibilities... and assuming we ignore the "20" in front of the last "11". In this case, there is an alignment of Venus-Mercury-Earth-Comet Elenin. This might also be a coincidence, but as Hoagland/Project Camelot (in the video linked above) have pointed out: such “coincidences” may be less random events and co-inciding ones. Something definitely seems to be in the works... and quite possibly, these facts are well understood by governments as well as eccentric speculators such as me and thee. Then there’s FEMA, another one of those radical, leftist, fear-mongering groups. On June 9, 2011, FEMA issued a joint press release with the FCC [Federal Communications Conglomerate... actually Commission... beholden to Corporate interests] in which there was to be a “Nationwide Test Of The Emergency Alert System”... said test which, prophetically, was scheduled for 11/09/11. Hoagland, et al found this coincidence a bit much as well. After all, this is the FIRST test of the Emergency Alert System (EAS), and for it to be promulgated well ahead of time... shouting from the roof tops that 11/9/11 is a day to pay attention... is very, very... curious. It’s hard to imagine how anyone could get ready for gov... or even assume there was ever a ready gov... but then again, I probably should look up the web link before getting too carried away. Up to this point, we have been concentrating on Elenin... such is the power of hype. However, this smaller, 400 meter wide asteroid has generated a bit of interest in and of itself... not to mention all those strange and bewildering coincidences of dates. To being with, we have to point out that 2005 YU55 is a local boy, wandering purposely between the orbits of Mars and Venus for lo these many years... and occasionally, with respect to the Earth, dropping by for tea. YU, as his friends call him, is one of the poster boys of the Near-Earth-Object NASA program. The fact that 2005 YU55 is doing its thing with respect to Earth within days of the Elenin bit... is quite possibly just a bit too much. Other fun dates include June 9, 2011 (The FEMA press release) when YU55, Mercury, Venus, and Mars were in approximate alignment; there is a repeat of this same alignment just prior to the July 1st Solar Eclipse; October 17th (see Elenin's Table above) with an alignment of Earth, YU55 and Mercury (and almost Venus); and on the really relevant date of 11/8-9/11 when Earth, Mercury, and Venus are in a near perfect alignment. It might be worth noting that YU55 has an orbital period of 1.22 years, a low inclination of 0.5131 degrees and is due to pass even closer to Venus on 17 January 2029. YU gets around, the rascal! The latter date is of course only a few months prior to Apophis  giving Earth a near fly-by on... of all of the friggin’ dates... Friday, the 13th of April, 2029. Geez! You know... it just might be time to check out www.Ready.gov... and perhaps upping the ante a bit with a month’s worth of supplies (as opposed to 3 days... and thus allowing for quite a bit of additional time for DC to actually get the word... particularly on a weekend). Obtained from http://ssd.jpl.nasa.gov/sbdb.cgi?sstr=C/2010%20X1 -- click on “Orbit Diagram”, second line below name of object (e.g. Elenin)... and then play with it. Obtained from http://ssd.jpl.nasa.gov/ ... check "ephemeris". UT is not University of Texas time, but “Universal Time”, aka Greenwich Mean Time (GMT), the latter unrelated to Thames Nasty Time (TNT). "In all analyses of trends, cycles, and so forth, there is always the possibility of a Wild Card. This is the case where all bets are off... and every trend is disrupted. The best example might be Apophis... scheduled for a 2029 event (curiously, Friday, April 13th of that year). "In the case of the asteroid, it has an inclination of ~40 degrees, is 400 meters wide (four football field lengths)... and an impact -- were it to hit the Earth -- that would result in a release of energy roughly 100,000 times the Hiroshima bomb. Can you imagine giving your all in a war, only to have much of your success nullified by just such an asteroid? “The analysis of Apophis previews situations likely to be encountered with NEAs yet to be discovered: a close approach that is not dangerous [? ]; nonetheless close enough to obscure the proximity and the danger of a later approach (like Apophis in 2036).” In fact, the first fly by might amplify the trajectory prediction uncertainties caused by difficult-to-observe physical characteristics interacting with solar radiation as well as other factors. "Right now, Apophis is expected to approach within 15,000 miles from the Earth’s surface... or about 6% of the distance to the Moon." [Taken from World War III... and Other Fun Prognostications.] This distance is a lot closer than 2005 YU55.